During the summer, there are few things I enjoy more than listening to live music. And there are few places I’d rather enjoy it than Fenway Park in Boston. And there are few musicians I’d rather see than Jackson Browne and James Taylor. And so when tickets went on sale this past February for those two, in that place, my wife Linda and I were all over it. Yesterday, after six months of waiting, the day had finally arrived. It was pretty much a perfect evening from start to finish. Beautiful weather, easy parking, short lines, lots of friends, great music. Indeed, with the possible exception of having to endure 30,000 middle-aged white people dancing at once, I can’t think of anything I would have changed. There was one person there, however, who I felt bad for: Jackson Browne. I know, that’s kind of hard to believe. On what basis could I feel sorry for a man who has made – and continues to make – a fabulous living by travelling the world, speaking his mind, playing his music and doing what comes naturally? But last night was a special case. And that’s because Jackson Browne, despite all his fame, accomplishments and talent, was the warm up act. James Taylor was the show. Jackson started playing at 6:30 on the dot. It was still light out and the place was far from full. It had the feel of a free concert at a local park; I half expected him to read off the license plate numbers of illegally parked cars and tell us what to do with our trash on the way out. James stated at 8:00 in front of a packed audience in a darkened stadium. 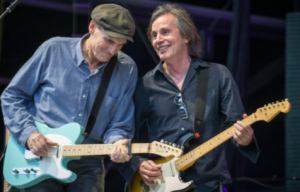 And while James Taylor had any number of other “advantages” with last night’s audience – he’s a Massachusetts resident, a huge Red Sox fan and has sold five times as many albums as Jackson Browne – absent all of that, the opening act would still have felt like the JV squad. The fact is, positioning matters. You can be the most talented musician in the world, but if you open, we assume you’re not as good. It’s the same with the content you create – it’s not just about the quality of what you do. How you put it out there matters too. Solution: Publish your own, original content. Whether you write it yourself or get somebody to help you with it, be the star of your own show. Sharing content without comment. Using social media to share interesting articles/posts or even creating a “curated” newsletter or blog is fine. But here as well, if all you’re doing is pointing people to the work of others, you’re still the opening act. Solution: When you share valuable content, always try and include a comment or two along with it. Even within the constraints of Twitter, you can add something like, “Great insight here,” or “I don’t agree with most of this,” or whatever. The point is, you’re not just passing it along, you’re weighing in. You know, the way experts do. Here’s the bottom line. We could talk all day about who’s “better,” James Taylor or Jackson Browne. And while there’s all kinds of data available – both subjective and objective – to support either argument, at some level, none of that matters. All it takes is one glance at the show schedule to form a fast opinion about who’s on top. Who was the opening act? Do you let people guest post on your blog or in your newsletter? Why or why not? First concert was Kenny Rogers, and the opening act was the comedian Gallagher. A very bizarre evening. Great topic. I’m in real estate and so many of my colleagues just send stuff out. I ALWAYS add my own spin and commentary on mailings and social media posts. So important to my brand to have my voice lead the way. And, I think it works. I get great feedback on my newsletter and social media. Oh, and clients and referrals! Great to know that’s working for you, Corey! And yes, a bizarre combination indeed with those two. Great article Michael and I totally agree with the two mistakes that people make in sharing or posting other people’s content on their blogs. – No, my blog is my voice and I feel I need to be authentic with my audience. However I do link to other quality content from within my blog posts if it makes sense. And that is a great throwback concert combination! Letting others blog: No. I enjoy interviewing people to hear their story and insights, though, and either publish a video or include some of their comments in my own work if applicable. When posting links on social media I use it 1) as a way of “social proof”…I’m not the only one talking about the topic; 2) to start a conversation; 3) to let folks know I study and read about what I “preach”. Not adding a question or commentary feels lazy to me! Sounds like you’ve got a good plan working there, Stacey! Love the insights! Have a good weekend. Thanks for commenting, Margaret. And I particularly appreciate the Til Tuesday reference. I was Aimee Mann’s bank teller back in the early 80s (Brookline, MA), back before ATM machines and when everybody came into the bank! 1 and 2. First concert: The Who. I don’t remember the opening act — although I do remember with exacting clarity the stoned out guy passed out in the women’s bathroom. That Who concert must have been great (and sorry about the passing out; I could have sworn it was the Men’s room). P.S. Thanks for appearing in the ice cream party video! Well done. Great newsletter as always, Michael. The first concert I ever saw after high school (and Debra Murphy feel free to applaud the fact there is someone older than you posting) was the Youngbloods and the opening act was Jerry Jeff Walker . First weekend, freshman year of college. An incredible concert by both artists but I will admit, Michael, that the Youngbloods were the main draw. Wow, that’s when the Youngbloods were, in fact, young. You may be today’s winner (but there is still time for someone to pull ahead). What year was that, Jim? 3) I’ve never thought of having someone guest post. I try to link to something related or interesting. Would be great to get a guest writer. P.S. Going to Pearl Jam at Fenway Park Sunday Night. No idea if there’s an opening act. Not Patty Larkin…but something like that. See, who remembers the opening act? That should be a great show as well, Harold! Thank you for the reminder to post our thoughts if we curate content. I’ve been thinking that I should do that. Wow, LJ, that must have been a great event! In similar fashion, my first concert was Bruce Springsteen in 1978 at Nassau Coliseum. Sort of like one’s first date being George Clooney – it’s been all downhill since then! Yes, I wondered how he feels about it. Comes in, sings for an hour, hangs out for 90 minutes backstage during the JT show and comes out for a joint encore. Maybe he loves the ease and low pressure of not always headlining! First concert: Van Halen, maybe 1982 or so. I was in high school at the time. Letting people post: I don’t have either a blog or a newsletter yet. Maybe one day. Ha ha! And maybe today is the time for your blog/newsletter! 3. Nope. Once in a great while I do an interview and post that on my blog, but I turn down guest blog requests and have been getting them more and more frequently. Good recovery on New Kids! 1. The Stylistics – how uncool is that? 3. Yes, I invite comments but rarely get them. I think the Stylistics is very cool. Stone In Love With You, right? Great questions. I went to so many concerts when I was young, this really brings back memories. The first concert I went to I sat outside the stadium and listened to the Beatles 1965 tour (I was a kid not even old enough to drive yet). King Curtis opened, but the screaming Beatles fans were so loud you couldn’t hear much of him. The first concert I got into was a few years later and it was The Band with two opening acts, John Sebastian playing first and Muddy Waters next. As for guest posts, no, I think my message is important and I don’t open the door for someone else’s message to take the place of mine. As usual Michael, another great post. I always enjoy your work! Since it was the Beatles, we’re going to give you full credit, even though you sat outside! How great would it be to go to that concert again today?! First concert: Marshall Tucker Band at the original Boston Garden. I was a freshman in high school and went with a bunch of upper-classmen friends. Let’s just say it was an eye opening experience. Opening Act: I have no recollection. It was a long time ago. Guest Posting: I don’t have a blog or newsletter yet. However, I was just asked to guest post on somebody else’s blog. That post will also be included as a chapter in a book that the author is writing. Oooo, a nice concert to attend, Andrew. And congrats on the guest post. Where those are concerned I’m a believer that it’s better to give than receive! 1. Johnny Cash and June Carter Cash. (I grew up in the boonies, wayyyyy out in the boonies). I have to say he was a heck of showman. 2. I don’t remember. It was a woman. And my mother was very vocal in her impatience for her to finish. 3. I was recently asked to guest post on someone else’s blog and thought I might ask someone for mine someday, but now I’ll reconsider! I did interview an attorney with expertise that I do not have for my next newsletter. A classic concert. It would be interesting to figure out who opened for them back then. And congrats to you as well for the guest post invite.